Request your email invitation today! Get 24/7 online access from any computer, smartphone or tablet! 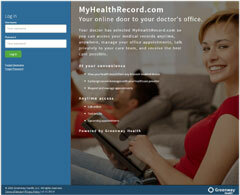 MyHealthRecord.com allows you access to your medical records anytime, anywhere, manage your office appointments, talk privately to your care team, and receive the best care possible. If you have not accepted our new patient portal invitation, call the office for an invitation or simply inform the front desk at your next appointment.